How do you think of the word "Luck"? I do have felt it every day, especially when I am in the most difficult time to fight with the sickness while to work on the management work and to learn on the art of painting, music and language. How do you understand the word "Friendship"? I have also felt it from all of the letters from so many friends every day, too. So, no matter what will happen in the future. As long as I can, I would like to do my best to read all of the letters from you and to cherish the friendship and my luck. Try to create something most beautiful to return you and all of the friends, to return the nice world with an grateful heart. Therefore, I would like to choose some of the letters that have touched me and encourage me so much and hope to bring you a beautiful enjoyment and a big smile. I will be happy to read them and try to respond you as long as I can, even though it may be a short note and can not be in time as usual. Take care and thanks, have a good new day. I'm totally agree that emotional self control is the key to healthy life. I have proved this formula by my experience. I am so sorry to hear about your health. I am praying that you will be able to continue your art and work. I was looking at the painting you sent me. It is so beautiful. My wife Liz, is making a special box frame to display it in. Let me first say how proud I am of your willingness to improve yourself. Even though your health is not as good as it could be. "So keep on keeping on" for yourself, Ok? PLEASE "slow down":) It sounds as if you are not giving yourself enough "rest time" yes? Take the "Inner Time" to know your Heart..................by doing so, the Body will be Vitalized for it is only through the Heart that we are Empowered in Health and Balance. I hope your Plum Blossom activities go well for you. Hello! It is always so good to hear from you. I'm still praying for God to touch your eyes so you can see to keep making such beautiful pictures. I am very happy about your health care. you are very sincere person. I like you. you please visit to India when will you free. Good to hear from you and glad you were doing better before your friend was robbed. Clearly ones physical health is very dependent on ones mental attitude. I’m glad to hear you are seeing some improvement. You’ve definitely pushed yourself very hard and there’s no doubt that your mental health impacts you physical health. Hopefully your renewed lifestyle will continue to pay positive dividends in terms of your health. Organizations can and often do place undue stress on employees, which can adversely impact their health and the longterm health of the company. Employees are like any other type of asset, organizations make a significant investment in their human capital in hopes of a return. If stress within the organization impacts the employee adversely the ROI from the employees productivity will be less. In the extreme, an employee might be unable to work or might quit do to the stress and the organization has a sunk cost with no hope for future ROI. I hope your health can be improved.. I am glad to hear that you are regaining your health and sleep pattern. I do agree that emotion management helps one to be more productive. It can help people to work together instead of disagreeing. Some ways that I think help to achieve emotional management is: discussing feelings in a support group (that does not judge what you say); writing down one's feelings ( maybe in a journal, regularly); and relying on one's "higher power" (God, gods, Daoism, Confucianism, etc. ), Confucian Analects are similar to the book of Proverbs found in the Christian Bible. I have discovered this while teaching Religions of the World. These things have helped me. Looking at art like your paintings helps me to relax and manage emotions. I am just beginning to practice using color and shapes-more of an abstract art. I'm not sure if I could be as patient and take the time to make such beautiful paintings such as yours. "Involvement Rather Than Immersion" we can be involved in Life while not letting it sweep us off our feet and send us spinning out of control. By taking one step back from an experience, we can then respond to it rather than simply react. We are NOT our Feelings. They are under OUR Guidance and Direction. They are like spices. A touch is wonderful but too much and it ruins the flavors of our food..but it must be US who takes the time to "add our chosen 'specific amount' of spices to our Lives so that they may be full and dynamic...............like how you paint - with Heart and Enthusiasm! Yet not to paint at the expense of your only body and mind! It seems that is what you have done. Now it is time to "reset" your patterns so that your Passion still flows i but not in ways that harm you. It is a question of Balance and Harmony dearest Shirley. And your Heart can help you to do this. Go to a place of regulated breathing, put your hands over your Heart and direct your attention to that Inner Space where there is Peace and Now-ness. Being Here Now is the only way to manifest your Healing as it is the only true "time" we have. Visualize a 'clear painting - like a painting on glass' of how you want your body to be and then immerse that painting into your body, seeing the transformation and healing. It has been known for Centuries that Stress can cause great harm to the body! A little stress is a good motivation, but too many times people allow stress to "run" them and thus the body begins to "burn out" just like a battery that is not recharged but always used too much. So, yes I DO agree with you that rest is a needed thing for you.BUT I ALSO believe that you must now alter and "reprogram" your mind and body with different "tuning" to Life as a whole. Otherwise, outside stresses, such as your friend's emergency, will catch you by surprise and "restimulate" your stressful patterns. I really enjoyed your newsletter. As a therapist, I learned that I can trust another person to solve their own problems. It is hard at first, but saying "how do you plan to solve this?" Helps, put the problem "monkey" on their back, so they take responsibility for their own problems. It is liberating, because we all have enough to deal with, without adding tons of other peoples problems. NOW - your art. I absolutely love the plum blossoms. They are so elegant. Also, I love the blue bird with yellow lilies. Wow, what wonderful colors and background and beautiful lines. Do you sell your art? My art is very different, abstract. Just beautiful your work. You sould be very encouraged. Have a great and mentally controlled week. It is good that you have decided to do something about your talent. I am sure it will be a hit. Do not waist anymore time. you have the most wonderful mind that i have ever felt, i can feel your thoughts and i agree with you..have a restful day.. I have read your recent letters with a sad and heavy heart. The failing of one's health dictates changes in life's schedule of events. Over the years as I read your letters, I often wondered how one person could accomplish so much in a single day. My thoughts were does that Lady ever take time to sleep, to relax and as they say, "Slow down and smell the roses." From your newest letter I do believe you have found the way to recovery and we pray you are on the right path. Your letter to me were a wake up call, saying I had better change my ways also. I thank you for your wisdom and wish you a fast recovery. Thank you for the message, and as always glad to hear from you. About your eyes, think of all the beautiful things they have seen, and there will much more. I don't know if the US has the best Dr's or not but I know they do a lot of transplants and eye care has came a long way. Each email you are doing so much you remind me of the little boy or girl in the first grade that just cant set still. always doing something. That is a real good trait but it can be carried to far. You have already accomplished so much and I remember when you sang to your mother how proud she was of you. You brought much joy to her and especially in her final days. The next week or so try to make Shirley happy as you deserve it!!!!! Take care and remember so many people love you. My friend...I am very much grateful you for your ddctn on writing. even when there is problem in writing because of your eyes but you always do writing. I love always to read all your email letters my friend and I am so very much impressed all those. How good to hear that you are ready and willing to "help yourself"! Our own Management Team is within us but needs only for us to "give it the 'Go Ahead'" to put new beliefs and actions into place. Sometimes the old habits may surface - but that is only for us to SEE Them for how can we release and replace that which we do not know is there? I have also come across a technique called EFT (also called 'Tapping') which may be of benefit to you. From the little I have read, it originated with Chi Gung and is accupressure point manipulation to dissipate the "energy blocks associated with certain activities and/or beliefs that we may have mistakenly taken on. It is very easy to learn and can be used at any time. I really enjoyed your very thoughtful letter on health management. You are a very special person to not only realize the need to take care of oneself, but also to put it into practice. I have a B.S. in Psychology and a M.A. in Mental Health Counseling. But now in this season of my life I am an artist. I have always been interested in art. In all of my electives I took art classes. This is about my life. Short outline. I have enjoyed your happy energy. The weather today June 13 is very hot and humid. We have been doing projects in the house. I enjoy my studio, it is good to go in and just create. I love art supplies - truly - it is fun. Flowers, birds ( have been feeding for 3 years) have a sweet little squirral. Song birds, robins, cardinals, goldfinches, and much more. Have the feeder by my livingroom window to enjoy. Love, ponies, lillies of the valley, we have cheery trees, red bud, dogwood (kousa), redbud. Hope today is a special. It's so good to hear from you again. How are your eyes? I'm so very concerned about you. Thank-you for sharing again. I am sorry that you must limit some of your work. The music and writing are wonderful, as well as your visual art. I will keep you in my mind and prayers as you do what you are doing and will do. i am very happy to know that you will keep going on working to keep yourself busy creating the goodies. i really value this friendship . hoping one day i could meet you. artist, if you don't follow the path of an artist, you will not attain destiny, and your body will not function properly. I have, all this time, read your letters when you sent them. still, it is a shame. but what can you do? these things are inevitable, how hard that may be. I know you are a very strong woman though, and will make the best of the future. May your own personal God go with you in these times. Hello Shirley, I am sad to learn of your difficulty with your health. As long as I have read your letters about your pasions and gifts, I believe firmly that you will choose to do what is needed to continue your love of learning and being an inspiration. Well I was surprised when I read yor e-mail and knew your actual state of health. Shirley, I just love your paintings and your talent. Shirley, i have been drawing since I was 6 years old. I dont have schoolar graduation on pictures neither specialization, I am just a lover of art and for many years it was my only expression of thoghts. Im just a person who wants to do things perfectly and with knowledge of things. I felt in the oriental thought the original basis of meanig and spirituality. It may sound strange from a foreigin person talk about this.Well, the most important thing i have in my life is faith . Shirley, I agree(=concordo ) with yuor position but i dont think a so many beatiful artistry like you will stay with no vision for a long time. Thats your really resposability. And more, our life was not gaven to us by our own force, but it comes from another force( God, if you wish,Christ or Bhuddha). I hope your confidence in yourself grow and make this another force , that is God and Bhuddha, take care of you and make you see clearly again. Shirley , i wish you happy . Thanks for the note. Please take care of yourself. I am very worried about your health. I will pray for you. I was excited to receive your newsletter as I always am but I feel saddened that you are still having problems with your eyes. I just don’t understand why this conditioned cannot be corrected. You are still a young woman and you should not be suffering with any health issues like this. If your condition is not able to be corrected then I think you are making the correct decisions or at least, you are prepared to make the best decisions when the time comes. I feel you have used good reasoning to arrive at your decisions. I think it is smart for you to pursue your dreams regardless of what happens. You have my sincere best wishes for a recovery to have normal eyes. God has given you a gift and your gift (besides painting and singing) is that you are meant to bring people together from all cultures and to share your knowledge of China and Chinese culture and to allow everyone to appreciate them. You are a great ambassador for China and I am happy to have you as my friend. Your paintings are very beautiful. Are they oil paintings? Thank you for your letters, which always make me happy to read and the photographs. I am pleased to see that your health is improved. My dear Shirley, if I may allow me, I suggest you to think of you as well. you need affection and love and I am sure if you open your eyes, this man is not far from you, he expects a gesture of you, for you declare his love. Do not shut up you, open your heart. I'm always listening to you because I you appreciate enormously. Congratulations on all the things you are doing in the world of Art and International efforts. 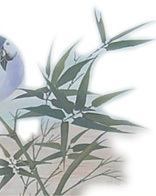 Do you have any resources about the Gong bi style of painting? That is what I'm specializing in currently. Thanks for getting back to me. I am looking for some good books on Gong bi that offer step by step instructions. I will of course work from my side regarding your healing - I am a Reiki Practitioner and know others and shall inform them as well so that they may send you 'Healing Energy'. I actually know two AMAZING Healers here in Denver!!!! The other thing is a technique from Hawaii called Ho'oponopono. All you have to do is go on the computer and Search "Ho'oponopono". The technique is VERY simple and effective! You have brought much pleasure to me through your paintings and just knowing you. It grieves me that you are having health issues . You are a viva rant woman with talent and caring in your heart and it saddens me that you are feeling down. Think of all the people you have brought joy to. Most people go through life and really don't make a mark.but that isn't you. Your health is the most important thing confronting you now. Take some time for Shirley and let your body regenerate. The Drs told you ,you need to do that NOW.. If you have enough money now, retire and just enjoy life you don't have to be productive until there is nothing else to give .You are special and I would like to be your friend for a long long time .Sorry if I scold you but it is only because I care. Thanks very much for keeping this friendship growing day by day. and i do appreciate you asking about me , well i am very sorry to hear about your health problem. honest so time i ask myself why bad things always happen to some successful people in life . is this a test to see how are doing tackling these hardship? or to test their determination to accomplish great in life so they will not be forgotten in the future?? . or is it a survival issue??.. if you look in history most of the inventors , musician. artist had some kind of hardship while man king is enjoying their creation. it seems to me that you are one of them . like a candle that burn to give light for the others to go on with their life. i can not relay tell what to do just follow you heart and do what makes you happy. again you are a good talented and gifted woman and you are living to give and not to take. Sorry for your visual problem. You might need to stop painting and recover first. Thank you for the wonderful e-mail. Hope you are feeling well. The weather today is cool with a lovely breeze. The beautiful Chinese garden in Montreal, reminds me of the peace of sitting before the lake and harmonious landscape. Sometimes we need to become one with peace. When is the dragon festival ? What shall you do on that day ? Hope you get well soon and your eyes recover quickly. We say in America, that the things that are "pleasing us are hurting us somehow". I will let you figure out how this applies to you, but it applies to me and almost everyone else. Once you learn what is important in life you will not need your eyes. Nonetheless, we all want to see and enjoy the beauty of the world and are surrondings. My point is simply that your work is umimportant and meaningless. Once you realize that our only purpose for living is to find God then you will find your way. You are like me and many other people, busy with all the things that do not matter. Your work, your career, your painting, your music. I am not suggesting that you stop doing these things, but recommending that you devote your life to a higher purpose. Learn about God and serve the lord. You can do this in your work, your career and your daily life. Your painting to not reflect the struggles and pain of living, nor the pleasure of life. They are nothing more than some birds on a branch or twig. Learn to use your art and music to express God's love and Joy, as well as the daily plight of all people. It is time for you to join the real world and understand life. Otherwise, your paintings, singing, and career will just be something you did while you were waiting to die. I learn these lesson many years ago from a great deal of personal pain. Sometimes, it is better to learn them from others than to experience them yourself. You must do what you feel is best, but I have learned many lesson about life during my journey. I am very much thankful for your mail and pictures. Appreciate your paintings fully and learn your skills. Also I would like to paint pictures and send to you. Wish you grand success in your expedition.